German Defense Minister Ursula von der Leyen shows Niger counterpart Kalla Moutari the trucks in the Camp Allemand at Niamey airport. Germany confronts Islamic terrorism by expanding influence in North Africa. Germany opened a new military base in Niger’s capital city of Niamey on November 11. The new base gives Germany a greater presence in a region rich with natural resources, and from which migrants reach the Mediterranean. 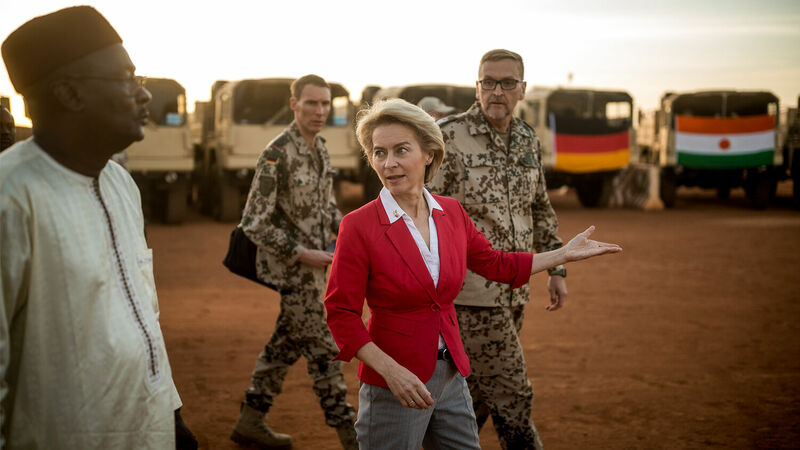 German Defense Minister Ursula von der Leyen met with counterpart Kalla Moutari in Niger to discuss the partnership between the two nations. At the ceremony, Germany granted Niger 53 military transport vehicles. Germany has also contributed 40 troops to be stationed in Niamey, out of a total of 900 serving in various nations in Africa’s Sahel region. Germany is involved in other defense projects in Niger, including the ongoing expansion of the military section of Niamey’s airport and the building of an officer training school in the area. Germany relies on natural resources from Africa’s Sahel region, especially oil. Strengthening relations with Niger will help Germany counteract Islamic extremist groups and will provide a measure of security for the German energy industry. Supporting the G-5 Sahel nations is one way Germany accomplishes this. After France intervened against terrorism in Mali in 2013, the G-5 Sahel was formed to combat ongoing threats from Islamic extremism throughout the Sahel. It is comprised of soldiers from Niger, Burkina Faso, Chad, Mali and Mauritania and funded partly by Europe. The European Union funds ensure that while the G-5 Sahel fights Islamic extremism in Africa, other European interests are advanced as well. One way EU funds accomplish this is by paying nations to reduce the number of migrants who reach the Mediterranean. The EU paid approximately €1 billion to Niger in 2017 to strengthen its military and help prevent migrants from using the country as a pathway to Europe. Germany’s recent delivery of 53 military trucks to Niger is also likely aimed at helping Niger’s soldiers deal with the migrants. Who is ultimately behind all these terrorist attacks? The king of the south—Iran. But it is being opposed now by Germany on many fronts. You are going to see these two powers clash very soon …. The Daniel 11:40 clash between the king of the south and the king of the north is about to be fulfilled! All of this violence in Africa is just a prelude to the fulfillment of this prophecy. Monitor these events closely and see if what we’re telling you doesn’t come to pass. So many prophecies already have. Never in mankind’s history has so much prophecy been fulfilled so rapidly! Events are racing along. This is not the world you knew 10 or even five years ago. It’s very different. Africa may seem distant to some, but what is currently happening there will affect you personally. To read more about where these fast-moving events are taking us, order your free copy of The King of the South, by Gerald Flurry.